The North Shore Forest Collaborative is offering a deer fencing package at the discount price of $30 per roll to help landowners get more white pine and white cedar trees planted and protected along the North Shore. Each package contains a 50- foot roll of 6-foot high fencing along with 10 7-foot or 4-foot lengths of rebar and 30 zip ties (for anchoring fence). Five single tree exclosures or one 12 ft. x 12 ft. exclosure can be made from each 50 foot roll of fence. Private landowners interested in this program must complete an online application. Accepted applicants will be informed in April. PLEASE READ DETAILS BELOW PRIOR TO APPLYING. White pine and northern white cedar are the focus of the program. The program’s objective is to help restore white pine and white cedar trees to the north shore landscape. The fencing provided through this program should be used for fencing these two species. Landowners are responsible for procuring their own tree seedlings. A list of sources can be found here. It is important to ORDER YOUR SEEDLINGS EARLY as nurseries often run out of white pine and white cedar, which are in high demand. (Do not wait to see if you get fencing. If you meet our qualifications, you will probably receive fencing.) NOTE: Hedstrom Lumber in Grand Marais is taking seedling orders via email through April 19th to COOK COUNTY landowners. More info about this offer. Two pickup locations for materials: Isak Hanson Hardware in Lutsen, MN and Two Harbors Lumber in Two Harbors, (Two Harbors Sold Out). Each pick-up location has an equal amount. You will be able to select your preferred pick-up location when you apply. Your actual pick-up location will be assigned after you pay for your fencing. WE CANNOT MOVE SUPPLIES FROM ONE SITE TO ANOTHER. YOU MUST PICK UP AT THE LOCATION LISTED ON YOUR CERTIFICATE. Two sizes of rebar this year. Based on comments from last year’s participants, we have ordered 2 sizes of rebar this year. When picking up your fencing, you may choose either 7 foot or 4 foot rebar – as long as the supply of your preferred choice lasts. Once one size runs out, you will need to take the size that is left. If you prefer one size over the other, be sure to pick up your fencing materials soon after the pickup dates are announced. Program is for private landowners living within the NSFC area. (From Lake/St. Louis County Boundary to the Canadian Border, and from the shore of Lake Superior to 3 miles inland). Businesses, organizations, governments, and schools are not eligible for the program. Double reimbursement is not allowed. Landowners participating in this program cannot claim reimbursement from MN DNR for the trees fenced with NSFC materials. 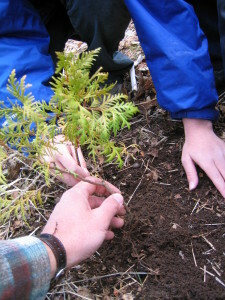 Documentation of tree planting and completing a survey is required as part of the program. As in past years, photo documentation or a site visit is required to complete your agreement to participate in the program. A few participants did not provide the required documentation last year and will not be eligible for fencing this year. Help with planting and erecting fencing is available to assist landowners who are physically unable to plant trees and erect exclosures on their property. Complete your application, and if successful, pick up your materials EARLY. REPEAT – Do not wait until the last possible moment to order trees, to apply for the program, or to pick up your materials. The cost to a landowner for each 50 foot roll of 6 foot high fencing, ten 7-foot lengths or 4 foot lengths of rebar and 30 zip ties (for anchoring) is $30.00, which is one-third the retail cost of these materials. Each 50 foot roll will provide for 5 individual tree exclosures, or 1 small area exclosure. We suggest that 10 to 15 exclosures be used per acre and be widely spaced and placed where there is an opening in the overstory created where a large tree has died. Leave your fencing around the tree(s) until they are at least 6 feet tall. The fencing is being provided specifically for protecting white pine and white cedar tree seedlings/saplings. This is the fourth year we are offering this program. In the first three years, 250 program participants planted and fenced over 6,531 white pine and white cedar trees on their properties along the shore. These same individuals planted an additional 29,927 young trees, including white spruce, which do not require fencing. 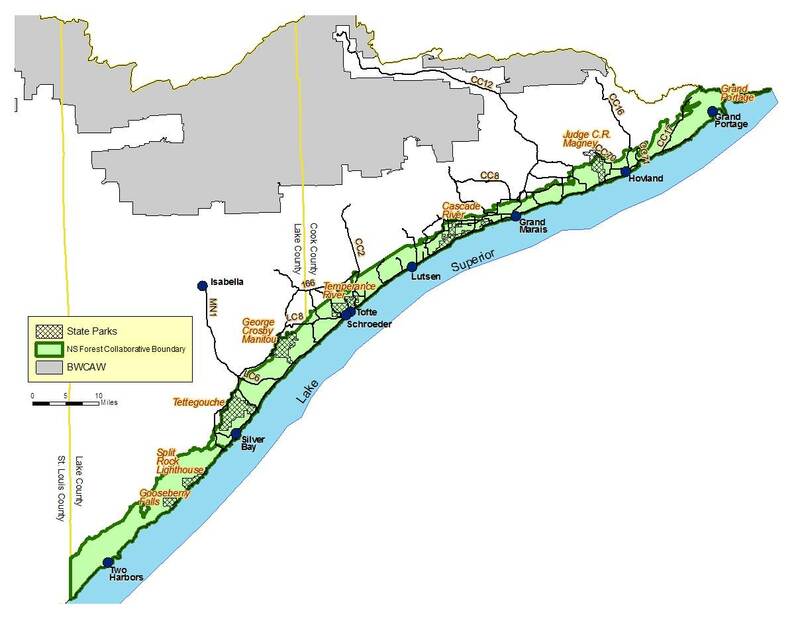 This program helps promote the mission of the collaborative, which is: To revitalize and maintain a healthy and functioning ecosystem along the North Shore of Lake Superior with emphasis on restoring and maintaining native trees and associated forest communities. You will be contacted by email and provided further information if you are selected for the program, including how to pay and where to pick up the materials. Those not selected or not eligible will be notified by email. This program is funded by a grant from the Weekes Family Foundation.